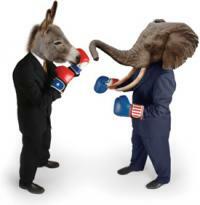 The other day, National Public Radio published a story about partisan politics. According to insights offered by Dartmouth College political scientist Brendan Nyhan in the story, partisans tend to be partial to their political loyalties on a range of issues, side-stepping the facts. When remaining loyal requires them to change their views of the facts, “partisans seem willing to throw even consistency overboard,” the article stated. While cognitive dissonance may play a role, three related areas of research may shed some light on partisanship. Writing in the aftermath of World War II with an intention to shed light on the subject of prejudice, Else Frenkel-Brunswik introduced the idea of “intolerance of ambiguity” as a distinct personality trait. She conceptualized intolerance of ambiguity as a mechanism arising from a need to cope with insecurities about being part of an excluded group. Based on a 1948 study of the attitudes towards ethnic prejudice of 100 adults and 200 children between the ages of nine and 14, Frenkel-Brunswik concluded, “Obviously, the less secure they are in their feeling of belonging the more they will insist on maintenance of the cultural norms in themselves and in their children.” In other words, holding fast to cultural norms protects people from the anxiety induced by ambiguous or uncertain situations. In the results of his classic 1980 survey of national cultures, Geert Hofstede noticed correlations among responses within countries to questions about job stress, respect for company rules, and a desire for long-term career. Hofstede conjectured that responses to the three survey statements might be related to fear of the unknown. “We assume that all three are expressions of the level of anxiety that exists in a particular society in the face of an uncertain future,” Hofstede wrote. Michael Hogg, a social psychologist at the Claremont Graduate School, has written about social identity theory and self-categorization. As Hogg stated in an article written in 2000, “The pursuit of uncertainty reduction provides a motivational framework for self-conceptualization in group terms—social identity.” People join with and identify with groups, the theory goes, in order to reduce uncertainty. Three researchers from three different research traditions in writing spanning six decades all point to the motivational force of avoiding uncertainty. If partisanship were only about avoiding cognitive dissonance, then people could just as easily reject their party affiliation as they reject the facts; either strategy would reduce dissonance. It seems that a more gut level dissonance may be at work. The greater the uncertainty, the more our affiliations provide psychological safety. As the world becomes more complex and the future more uncertain, we shouldn’t be surprised by a retreat to the familiar territory of our respective social groups.